NIVEA Canada is bringing back its pop-up NIVEA Haus campaign this summer, and things will got started in downtown, Toronto earlier this week. Then the campaign will travel across Canada with the mission of bringing to life NIVEA’s core values of trust, quality, closeness and good value and its commitment to truly connecting with its consumers both physically and emotionally. Between June and August, consumers in Toronto, Calgary, Edmonton, Vancouver and Montreal will get to experience the brand’s heritage of innovation and 100+ years of skin care expertise. NIVEA has created an all-new mobile format to make it easier for consumers to try NIVEA products, experience the latest in skin care services and analysis and learn from the skin care brand. 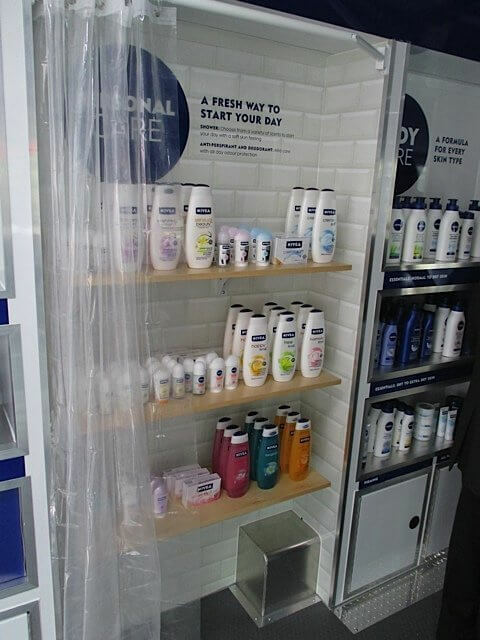 As part of the stops the NIVEA crew will be making, they will be making personalized skin analysis and the distribute more than 280,000 free product samples and 4,800 free full-sized samples. The NIVEA Haus will be housed in a 40ft x 20ft mobile unit (with the stage down), with different areas that showcase our various product lines, innovations and promotions. A “heritage” wall will highlight the 100+ year brand history and showcase vintage ads and images.